The image — which researchers stitched together from five photos of ISON taken by NASA's Hubble Space Telescope on April 30 — shows the icy wanderer blazing against a backdrop of galaxies and bright stars. All five images were captured by Hubble's Wide Field Camera 3 UVIS instrument, researchers said. Three exposures were made with a filter that transmits yellow and green light (represented as blue in the image), while two used a filter that lets in red and some near-infrared light. "In general, redder things are older, more evolved, than blue things — this is true both for the crosshair-spiked stars and the smudges of distant galaxies," Sokol wrote. Comet ISON is cruising toward a close encounter with the sun on Nov. 28, when it will skim just 724,000 miles (1.16 million kilometers) above the solar surface. The comet could get incredibly luminous around this time, perhaps shining as brightly as the full moon, researchers say. ISON has thus attracted a fair bit of "comet of the century" hype, with skywatchers and scientists around the world eagerly tracking its long trek toward the sun. Indeed, Hubble is just one of many instruments that researchers around the world are training on the comet as part of a coordinated observation campaign. Comets are primordial bodies made from the same fundamental building blocks that coalesced to form the planets 4.5 billion years ago. So scientists hope that close study of the material that boils off ISON as it nears the sun will reveal insights about the solar system's early days. While hopes for a great sky show are high, there is no guarantee that ISON will live up to the hype. 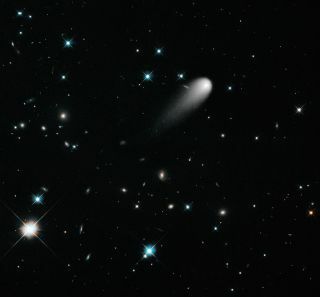 Comets are notoriously unpredictable, and ISON's behavior could be particularly tricky to forecast. The comet, which was discovered in September 2012, is thought to be making its first-ever foray into the inner solar system from the distant and frigid Oort Cloud.